Known as the “Bay State” (for the Chesapeake Bay), Massachusetts—officially the Commonwealth of Massachusetts—is the most populous state in the New England part of America’s northeast region, and a wonderful place for all sorts of recreational pursuits, including mountain biking. Massachusetts is home to many mountain biking hotspots, from challenging mountain courses to city-based trails that travel through places like Boston—the capital and largest city in the state—and allow riders to learn the vast history of the state. Massachusetts is bordered by the Atlantic Ocean to the east, the states of Rhode Island and Connecticut to the south, New Hampshire and Vermont to the north, and New York to the west, sharing many characteristics and terrains of its neighbors. Over 80 percent of Massachusetts’ population lives in the Greater Boston Area, a vast metropolitan region that has greatly influenced America’s long history and its economics. 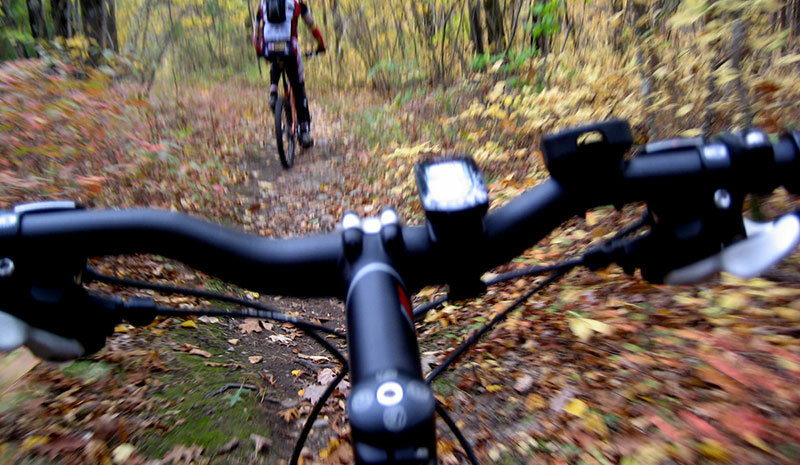 To help familiarize you with the different types of mountain biking trails found in Massachusetts, below we have highlighted and detailed five of the state’s most popular and well-loved courses, and provided some in-depth information regarding each trail’s characteristics and the difficulty level and challenges they present to riders. Located in the town of Charlemont, Massachusetts, the Charlemont Trails features aspects and characteristics that are sure to please every level and type of rider, from the novice just learning how to handle their bike, to the expert rider looking for a competitive edge in their next big race. Among the many well-marked and varied trails at Massachusetts’ Charlemont Trails Park, the locale features a blue-dot beginner’s course, an intermediate-level trail, and an expert skills park simply loaded with technical obstacles and features. The beginner course, intended mostly for novice riders and family groups, is a wide and winding track that exposes riders to all of the natural beauty and wonder this gorgeous location has to offer, without some of the impediments and elevation changes that are more representative of the park’s tougher routes. The green course at the Charlemont Trails features a few tough ascents, some thrilling downhill sections, and just the right amount of roots and rocks to keep riders on their toes. Finally, the “black-diamond-rated” skills park is intended to help prepare competitive riders for what they are likely to encounter on a true racing course, including tabletops, jumps, berms, bridges and even some natural creek crossings. Collectively, the various courses at the Charlemont Trails Park have made this well-known recreational area one of the most popular of its kind in the region, consistently drawing riders of all ages from across the state. Situated in the town of Chelmsford, Massachusetts, Russell Mill is a seven-mile intermediate-rated collection of courses, although there are sections of the park that would appeal to both beginner and advanced riders as well. The Russell Mill ride commences from Great Brook Farm with some easy and fairly free-flowing riding, followed by a moderate climb and a rapid and entertaining descent. Once at the bottom of the hill, riders will encounter a number of technical obstacles and challenges, including, but definitely not limited to, roots of various sizes, rock gardens, berms, jumps, drops and shallow creek crossings. Collectively, these challenges make Russell Mill one of the more popular assortments of courses in the region, drawing hundreds of off-road cyclists each month looking to test their nerve and improve their bike handling skills. Of the various courses at Russell Mill, the Orange Goose Loop is probably the most technical and difficult, due largely to its narrow boundaries and consistent drops. Once riders finish this course, the trail transitions into the Green Birdhouse Loop, an easy trail that brings riders full circle back to the starting point. The park in which the Russell Mill Trails are located is set against a breathtaking backdrop, one that perfectly—and beautifully—represents the local flora and wildlife that makes Massachusetts such a wonderful place to live and visit. The 30-mile, intermediate-rated course at Otis Mountain is generally considered one of the best routes in the state, a course loaded with the speed and types of obstacles and challenges most riders seek. Situated in the town of Bourne, Massachusetts, this single track course boasts a semi-grueling uphill section, several abbreviated, yet very rapid descents, and impediments that include rock gardens, roots, main-trail and side-hill berms, skinnies and a whole series of well-placed switchbacks, which, while slightly easing the difficulty of the course’s uphill sections for riders, also make for a daredevil-like experience when these twisty turns are repeated during the trail’s freefall descent. Located in the town of Swansea, Massachusetts, Abram’s Rock Mountain Biking Park (situated within Village Park) is a five-mile, intermediate-rated course and a wild and entertaining ride through some of the most gorgeous scenery the state has to offer. In fact, the Village Park/Abram’s Rock area is ranked as the number one course in the state by the website “SingleTracks.com. Rolling on mostly hard-packed single track, Abram’s Rock features some great “ups and downs,” including a taxing uphill climb, with several switchbacks to help riders make their way up the hill; and a fast, virtually pedal-free descent down a five percent grade. The flatter portions of the course are loaded with expertly-placed hindrances, both natural and manmade, including rocky outcroppings, roots, banked turns, jumps and bridges. Together these obstacles make each ride at Abram’s Rock a truly special and challenging event. In addition to Abram’s Rock, Village Park also features several unusual rock formations, also known as “pudding-stones,” with names like Wildcat Rock and Lion Rock. Some of these can be ridden but most are easier to hike. The Village Park Trails are frequented by hikers, dog walkers, runners, and bikers alike. All trails are maintained throughout the year and are generally in excellent condition. The exception to this rule is during wet seasons, where riders may find some muddy areas, but the many bridges do allow safe (and dry) passage over the worst areas. By looping trails within the park, the designers have enabled riders to crank out a decent 10 to 12 mile ride. There is some climbing involved, but for the most part cyclists will find a smooth fast ride that flows effortlessly through the park. The mixed trail system known as the Singletary Trails features an interesting mix of courses, with routes designed for riders of various skill levels and levels of experience. This fine array of courses is located in the town of Millbury, Massachusetts, and includes tracks for beginners, intermediate-level riders and even experts. The Singletary Trails, all of which are connected by a fire road, are known to be very tight and twisting. There are plenty of sharp turns, roots and stone wall crossings, as well as some berms and well-placed jumps, all designed to keep riders on their toes. Fortunately, there is very little climbing at this locale, as the elevation change is less than 100 feet. For novices, family groups and recreational cyclists, the Singletary Trails are perfect. Their beginner routes require only a small bit of technical knowledge, but not an incredible amount of effort, leaving time for riders to fully enjoy the beauty of their surroundings. The more advanced track at the Singletary Trails is built for those looking for a tougher challenge and a bit more adventure. This course begins with a gradual climb that is slightly aided by a collection of tight switchbacks. It then transitions into a very technical descent, with plenty of obstacles to avoid. Perhaps the best part of the Singletary Trails Park is its peaceful and serene setting; a canopy of local trees provides a cooling tunnel of shade for riders to traverse, and the local wildlife, including many different varieties of birds, serenade riders as they make their way along the course.